As a homeowner, you need to be sure that the water coming from your taps is pure and free of potentially dangerous contaminants. Even if your water looks clean, you could have a backflow problem that you are unaware of. Backflow from waste water or even a sprinkler system can seriously compromise the purity of your drinking water, so it’s a problem that cannot be ignored. 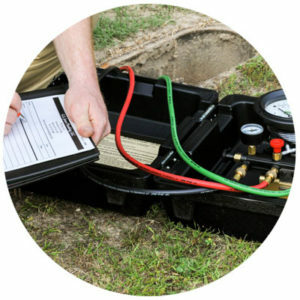 At Lightfoot Mechanical, we offer backflow testing in Fort Worth and the surrounding areas, and we are here to give you peace of mind about the quality of your water. Residential homes have a reduced pressure zone, or RPZ. The RPZ serves as a means of preventing backflow to ensures that the water flowing into your home is contaminant-free. If your RPZ valve is not working like it should, contaminants known as backflow can flow out of your faucet. Backflow testing is conducted to determine whether the water coming from your taps is contaminated with backflow. We recommend investing in backflow testing annually to make sure there are no problems with your water supply. If backflow is detected, we will take the backflow prevention device apart, thoroughly clean it and reassemble it to make it function like it should. If this does not work or if we detect damage that cannot be fixed, we will replace it. At Lightfoot Mechanical, we offer trusted backflow testing in Fort Worth and the surrounding communities. Our technicians are highly trained, and they are licensed to provide all of the plumbing services you need. They’re experts when it comes to backflow RPZ testing, and you can depend on them to make sure you and your family have access to fresh, clean water at all times. To schedule an appointment for backflow testing in Fort Worth, reach out to a trusted plumber in Fort Worth today. Call 817-803-3151.